Click on pages to view large image. In 1968, Case Institute of Technology in Cleveland, Ohio in the United States adopted an innovative strategy toward upgrading the equipment in their computing centre. Since computer speed had increased by more than a factor of four since the installation of their UNIVAC 1107 in the early 1960's, they reckoned that they would be able to meet near-term computing requirements with only 25% of the capacity of its next generation successor, the UNIVAC 1108, especially since the architecture of the 1108 permitted multitasking which, in conjunction with faster peripherals, were able to handle the student and research workload more efficiently. Since UNIVAC couldn't sell you a quarter of an 1108 in those days (ironically, not long thereafter they introduced the 1106 which, in its early incarnations, was literally half an 1108—identical hardware tricked to run at half speed), Case decided to spin off its computer operation as a private company, Chi Corporation (so-named because the original planning was done under the name “Project X”, which the Greek letter chi resembles), which, as a for-profit “computer utility” (the A-number-one buzzword of the time) would sell 25% of its compute time at bulk rate to the university and market the remainder to other customers. Many pundits of the day believed that in-house computing facilities were doomed to extinction as clients discovered it was cheaper to use a “computer utility”, just as it's more economical to buy your electricity from a power utility instead of making your own with a diesel generator in the basement. And since Chi Corporation would be born with a “base load customer”—the Institute—which paid the bills, it would have the time to be able to recruit customers and evolve as the “computer utility” era dawned. Other than billing the University (for by this time Case Institute of Technology had merged with adjacent Western Reserve University to form Case Western Reserve University: “CWRU”—an acronym which seems as clumsy today as when first voiced in 1967) as base load customer, Chi Corporation's first cash-generating product wasn't computer time but rather a piece of cardboard, fondly remembered by every UNIVAC programmer lucky enough to own one and cherished as a memento of those sepia-toned days of boundless optimism by folks who haven't lost track of theirs over the years. Here's your very own, on the Web. Its official name is “ System Programmers' Reference Card , XP-1001”, but everybody called it the “code card” or “Chi card”. 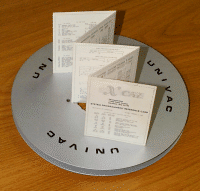 This was a five panel fan-fold reference card, printed on white stock a little stiffer than a punch card, 125 mm high by 87 mm wide (a tad larger than a Palm Pilot, but nowhere near as thick). Folding out the front page revealed pages documenting register assignments, character sets, word formats, interrupt locations and processor state register bits, and I/O peripheral function and status codes. The flip side, printed in landscape format, documented the 1108 instruction set in five concise pages in ascending order of operation code: 000-DI, DSF-MSW, MSNW-DSA, LSC-LICM. and JIC-077. Close examination of the Chi Card reveals that apart from the typeset titles on the front page, the entire content was plotted on the large format CalComp drum plotter connected to the Chi UNIVAC 1108, probably with one of those horrid Rapidograph India ink pens which were forever clogging and skipping. The need to clean them frequently and the messiness of the process made it easy to identify the ink-stained wretches who frequently used the plotter. The original pages were plotted many times larger than the scale of the card with a broad-line pen, then photo-reduced to the scale of the card. As to who was responsible for producing the card, I simply have no information. Rumour has it that David Santich was involved in at least the plotting process, since his office at Chi was decorated with the large-scale plotted pages. If anybody has information on who was involved in all the stages of production and/or any anecdotes about the process, please pass them on so I can include them here. The first edition of this reference card, reproduced here, contains an error. Can you find it? When the cards were first put on sale at US$1 a pop, Chi offered to refund the purchase price to the first person to report any error. I was short on cash, but what I had in abundance, like most students, was free time, so I immediately sat down to check every single item on the card to get my precious dollar back, and darned if I didn't find an error almost right away. I duly pointed this out and got my money back; as far as I know this was the only error ever found in the card, and I was the only student ever to obtain one for free. This dollar was the first I ever earned in the computer industry; in retrospect I probably should have framed it like Uncle Scrooge's “Old Number One”, but lacking historical perspective and assigning a higher priority to eating at the epoch, I blew it at the cafeteria. If you don't want to repeat my three decade old quest, congratulate yourself for having a well calibrated sense of priorities and go directly to the answer. Special thanks to Eric Nellen for supplying the card from which this page was created. The physical card, along with all the original documents in UNIVAC Memories , will eventually be offered as a donation to The Computer Museum. UNIVAC has been, over the years, a registered trademark of Eckert-Mauchly Computer Corporation, Remington Rand Corporation, Sperry Rand Corporation, Sperry Corporation, and Unisys Corporation.